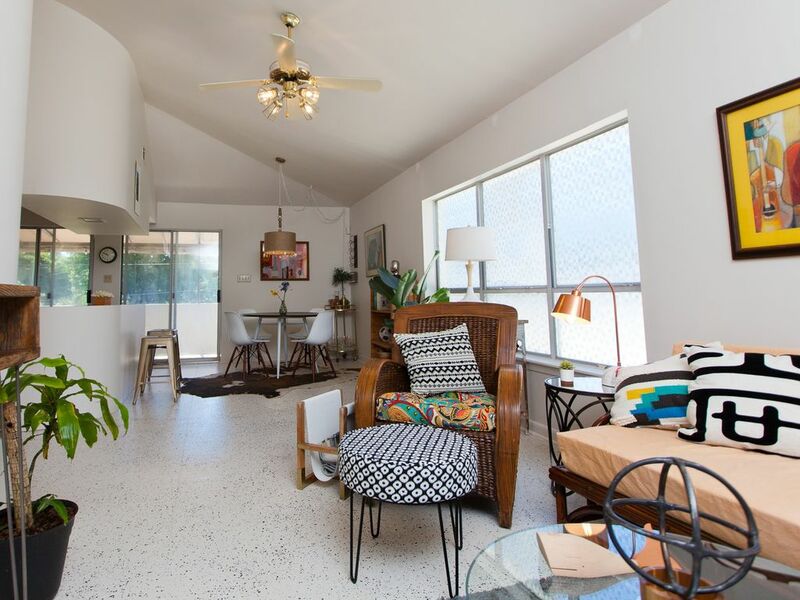 This Mid-Century Modern apartment will entice you to park your car (or come by Uber) and stroll through or ride the bikes included, the historical neighborhood streets to the downtown area. You can take a morning walk on the sugar white beaches just steps from your location.There are five casino's within a quarter mile from your place, three to your left and two to the right, yet you'll return to an upstairs apartment, among the oak trees, in a lush, park like setting that's quiet and filled with bird songs. You'll find unique shops, fantastic world famous restaurants featuring fresh locally caught seafood all within walking distance. There is first class entertainment for your evenings or Eco trips to the close barrier islands to add adventure to your days. You can catch one of the most vivid colored sunsets ever experienced from your own private balcony, while your fresh seafood or steaks sizzles on your grill. To assure you wake up rested, you can turn in to the "Hollywood Suite" complete with "Marilyn". All the carefully thought out details in the apartment will take you back to a time of comfort and simple glamour. You'll find the king size bed so comfortable, the sheets soft and the towels fluffy. Though you will have complete privacy at all times, the owner's are close by in order to help you with anything you may need or to give suggestions of their favorite local spots. You'll have fun filled days but will look forward to returning to your refuge, the De Ja "View" each evening. Paul and I have put hard work and love in designing, furnishing and preparing this vacation rental though this is our second. We bought this property in 2015 and have worked on it until our opening on September, 2017. At one time, we understand, this apartment was occupied by the valet (driver) for the couple that owned the property for many years before us. The driver's job was to take them to New Orleans every weekend so they could enjoy the cultural events, have martini's and then be driven back. We instantly envisioned this space as a vacation rental. When the doors are all left open and the sea breeze flows through, you'll feel as though you're staying on a boat minus the rocking! This space is airy, lots of natural light, surrounded by greenery and sea breezes. The location could not be more perfect if you want convenience, a very cool sixties decor with an amazingly comfortable bed and linens. This space is over a three car garage, used for storage at this time. The building is within a gated, private compound. The balcony surrounds the apartment on three sides and are covered in fabric awning for your comfort. The ceilings are tall and the floors are unique. But, best of all is the location. Perfect! My wife and I enjoyed our two day stay at Deju View. I enjoyed meeting the two of so much and I’m pleased you enjoyed your stay. Please think of the DaJe “ View” the next trip over to the coast. Hope to see you again in the near future! Spent 4 nights and really enjoyed our stay. Will definitely be back. Thank you, Robert! You were the perfect guest! Hope to see you again soon! Carol and Paul, thanks so much for helping to make our 25th anniversary wonderful! DEJAVIEW has an awesome view of the beach from the wrap around balcony. We very much enjoyed being able to walk to so many attractions and restaurants as well as the beach. Everything was very clean and quiet. It was truly an honor to host the two of you for your 25th anniversary and it was such a pleasure to meet the two of you. I felt as if I was reuniting with old friends even though we had just met! Thank you for your generous review of the Da Je "View". Please keep it in mind for your next celebration. We'd love to host you again in the near future! We loved this space. I wanted to take the mattress and pillows home with me as I’ve never slept so well away from home as I did here. Or maybe it was just the silence. Such a sweet little place and Carol was helpful and nice. Thanks! Will definitely come again! One of the pleasures of owning and managing a vacation rental is meeting great people like you, John, and your wonderful wife. It makes me so happy to know that you were comfortable and happy with your choice of the DaJe “ View”! I sincerely hope that the two of you will return again real soon! Have a great summer! Thank you for your kind review. I so enjoyed meeting to two of you and hosting such great people. Wish there had been more sunshine. Please come back soon. We had a wonderful stay in this retro chic apartment! Carol is a gracious hostess who thoughtfully provides plenty of extra touches for her guests. She was also easy to communicate with and prompt with replies to any questions. The location was great, about a 10-15 minute walk from casinos, restaurants, and museums. We would love to stay here again someday. Thank you, Margie for your generous review! I so enjoyed meeting you and Bill and feel honored to have hosted the two of you. We would love to have the two of you as guest again. Hopefully it will be sooner than later! Hope the weather becomes mild soon near your home. Take care! We are in a prime location for shopping, to nightlife, fine dining as well as casual fare restaurants. There are 5 casinos within a three mile radius. There is also fishing , an island ferry and kayaking within walking distance. You can also catch a minor league game at the MGM Park which is 1/4 if a mile away.